The process of establishing the valence states of iron in radioactive uranium-thorium bearing mineral allanite is essential in evaluating the effect of radiation in its crystal structure. 57Fe Mössbauer spectrometry has the capability to determine the iron in the different lattice sites with their specific valence and the distortion of their environment.. Transmission 57Fe Mössbauerspectroscopy configuration at room tempeature has been used to investigate iron ions of allanite found in Ombo, Palawan. Mössbauer spectrum shows asymmetric quadrupole split doublet suggesting that the spectrum was a superposition of many sets of doublet subspectra. Spectral deconvolution was then performed based on the notion that Mössbauer spectrum is a superposition of Lorentzian lines. After spectral fitting, the hyperfine parameters were obtained, as well as the iron oxidation states and their sites in the mineral structure. Mössbauer spectrum showed much higher Fe2+ doublet intensity than Fe3+ . 84% of the total Fe is Fe2+. J. F. Jecong, C. A. Dingle, F. Hila, G. E. Lopez, P. Saligan†, and N. R. Guillermo. 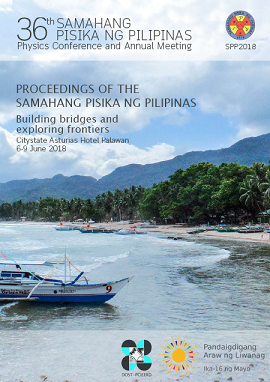 Determination of Fe ions in allanite from Ombo, Palawan through Mössbauer spectroscopy, Proceedings of the Samahang Pisika ng Pilipinas 36, SPP-2018-PC-29 (2018). URL: https://paperview.spp-online.org/proceedings/article/view/SPP-2018-PC-29.